Administrative Law Judge (ALJ) Robert K. Rogers, Jr. of the United States International Trade Commission (USITC, or just ITC) today denied a motion by Samsung to throw out six of InterDigital's seven patents-in-suit in the investigation of a complaint InterDigital filed at the beginning of January. Samsung's co-defendants are Huawei, ZTE, and Nokia, but the primary target -- the only respondent to face the full set of patent assertions in this action, while the other defendants were previously sued over some of them -- is clearly Samsung. 05/10/2013 12:54 PM, Order No. 25: "Denying Samsung's Motion for Partial Termination of the Investigation"
03/04/2013 04:49 PM: "InterDigital's Opposition to Samsung's Motion for Partial Termination of the Investigation as to Importation by Samsung of Articles Alleged to Infringe U.S. Patent Nos. 7,190,966; 7,286,847; 7,616,970; 7,706,830; 8,009,636; and 7,502,406"
03/04/2013 02:30 PM: "Commission Investigative Staff's Response to Samsung Motion for Partial Termination"
02/21/2013 05:10 PM: "Respondent Samsung's Motion for Partial Termination of the Investigation as to Importation by Samsung of Articles Alleged to Infringe U.S. Patent Nos. 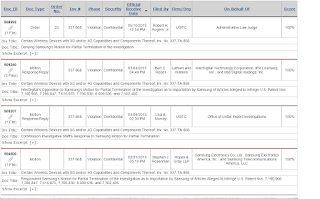 7,190,966; 7,286,847; 7,616,970; 7,706,830; 8,009,636; and 7,502,406"
These six patents are the same that Samsung claims to have been licensed to until the end of 2012, but the samples of allegedly-infringing products that InterDigital purchased and provided to the ITC along with its complaint were purchased prior to expiration of that license agreement.. Samsung already raised this issue to delay the institution of the investigation, which didn't work. For details on these allegations (which are virtually certain to be the subject of the denied motion) let me just refer you to the posts I linked to in this paragraph, and I'll also provide another link (to a post on InterDigital's response to Samsung's request to delay institution). InterDigital's contingent motion to amend the complaint (in the event of Samsung's motion being granted) has been denied as a result of the denial of Samsung's motion for partial termination. It's possible that the ITC judge allowed InterDigital to simply replace the samples of allegedly-unlawful imports. 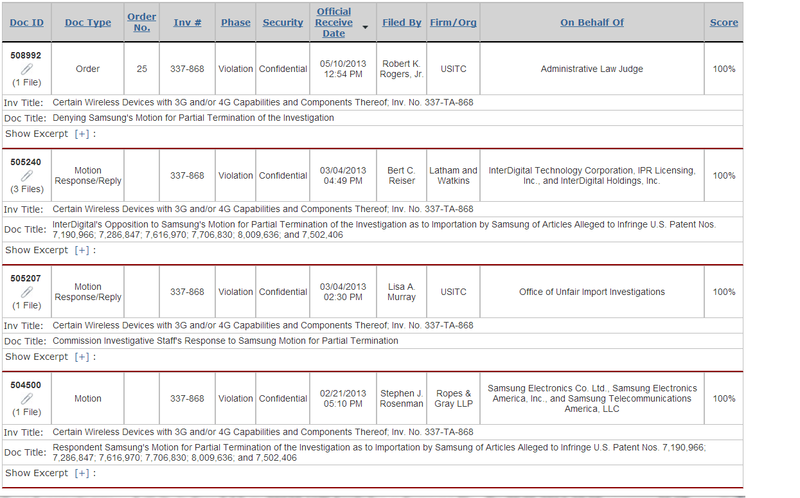 It's also conceivable that Samsung's motion failed because it can't deny that it keeps importing at least some of those products into the United States, making it less relevant whether there was a license agreement in place at the time InterDigital purchased its samples. Anyway, I think complainants should really wait until a license agreement has expired and purchase their samples of allegedly-unlawful imports then, not before -- so in my opinion Samsung had a point. Maybe we'll find out about the rationale behind this denial if and when redacted versions of the briefs and/or the decision become available.